"Ready Go" (Ready Go!) 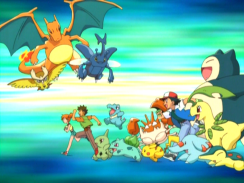 is the fifth opening theme to the original Pocket Monsters series. It is also used frequently as an insert song in every series since then. Mune ni hibi'ita koe "Kimi nara daijoubu!" The voice in my heart says "It'll be OK!" I turn around and see everyone smiling. And reach out to the dazzling sun. I continue to take steps toward the future. Ready go! Further and further!